Library image #3859: Desert water storage, Goblin Pots. The United States Congress designated the Red Mountain Wilderness (map) in 2009 and it now has a total of 18,689 acres. All of this wilderness is located in Utah and is managed by the Bureau of Land Management. Within Red Mountain Wilderness, it is easy to see that Zion National Park's world-famous landscape of soaring cliff walls, forested plateaus, and deep, narrow gorges extends well beyond the boundaries of the park onto surrounding BLM and USFS lands. In this area, clear mountain streams descend from the juniper-dotted uplands into a network of canyons. On the highest plateaus, islands of ponderosa pine forest are surrounded by cream-colored slickrock. Seeps in the canyon walls provide water for bouquets of maidenhair fern, scarlet monkeyflower, and columbine. Hawks, falcons, and eagles nest along the sandstone walls, while ringtailed cats, deer, cougar, and bear live in the canyon bottoms. Elevations roughly range from 3,300 to 5,400 feet in this wilderness. Water is everything here. It is the architect of natural stone temples and slot canyons; it is life to the area's many plants and animals, sustenance to the nearby human population. Yet it is a capricious provider -- sometimes coming not at all for months, sometimes swelling the canyons with floodwater. 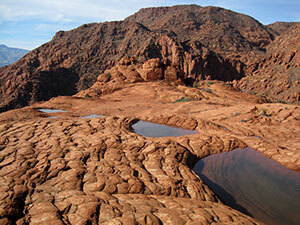 Red Mountain Wilderness receives between 10 and 14 inches of precipitation each year. Summer temperatures often exceed 100 degrees Fahrenheit with temperatures in excess of 90 at higher elevations and day and night temperatures differing by over 30 degrees. Winters are cold and often wet with temperatures ranging from highs of 50 to 60 degrees during the day to lows well below freezing at night. Red Butte Wilderness contains many challenging and delightful canyon hikes. Consequently, the area receives heavy recreational use. Hikers and backpackers enjoy panoramic vistas of the spires and mesas of Zion National Park to the east, the Virgin River Gorge to the south, and the high peaks of the Beaver Dam Mountains on the west. Equestrians find many opportunities for trail riding in the Red Mountain Wilderness, with some trails leading to spectacular overlooks into Snow Canyon, where black basalt flows overlie the red and white Navajo sandstone, creating a dramatic visual contrast. There are 10 miles of maintained trails in the Wilderness. Planning to Visit the Red Mountain Wilderness? How to follow the seven standard Leave No Trace principles differs in different parts of the country (desert vs. Rocky Mountains). Click on any of the principles listed below to learn more about how they apply in the Red Mountain Wilderness.